When I heard that FCA was throwing a contest for high schoolers grade 10 to 12 to design the 2025 SRT Hellcat, I was excited, but also very jealous. Drive for Design started out in 2013 as a local contest in Detroit to educate young people about automotive design, but now the contest has opened up nationwide for all students to participate in. If you’re a high school student with a creative mind and an eye for design, this is an amazing opportunity to show some of the best in the business your skills and creativity. Do you picture the SRT Hellcat staying in the Charger and Challenger chassis, or do you see it maybe branching into the Durango or maybe a whole new model that doesn’t even exist yet? It’s completely up to you, and Fiat Chrysler Automobiles wants to see what you’ve got. 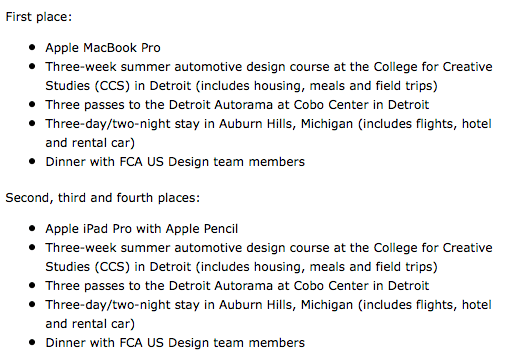 Not only will your work be seen by lead designers of the seventh largest automaker in the world, but there are some amazing prizes as well. If those aren’t cool gifts and incredible networking opportunities, I don’t know what are. All four talented winners will be announced at a special presentation on February 26th, 2016 at non other than Meguiar’s Detroit Autorama, because what better place to announce the futures of auto design than what’s known as America’s greatest hot rod show. Don’t delay, as the deadline for all submissions is January 8, 2016! Check out the contest rules and regulations at FCAdrivefordesign.com and make sure to like Facebook.com/drivefordesign for updates on the competition, and don’t forget to use the hashtag #DriveForDesign.